Super U Series pumps are designed with ease of service in mind. Because they are self-priming, they can be mounted above the liquid being pumped. Should service or maintenance be required, it can be easily performed using common hand tools without disconnecting piping. With no elongated shafts present, routine service can be performed in confined work spaces. All Super U Series pumps can be coupled to a standard NEMA motor, which means there’s no waiting for special motor parts. 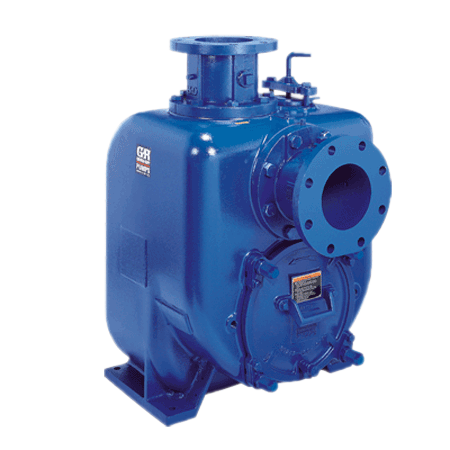 Gorman-Rupp Super U Series® pumps are available as basic units, ready for connection to power or flex-coupled or v-belt driven by an electric motor. When space is limited, flex-coupling often solves confined area issues. V-belt driven configurations offer the advantage of flexibility in speed selection and usually provides maximum operating speed for required head and capacity without needing to trim the impeller. Various belt and sheave options are available. Multi-vane, high efficiency solids handling impeller constructed of ductile iron. The impeller will handle up to 1 1/4" diameter solids. Exclusive double-floating, self-aligning, oil lubricated mechanical cartridge seal with stationary and rotating face of silicon carbide or tungsten titanium carbide is specifically designed for abrasive industrial service. Fluorocarbon and PTFE elastomers are also available. The removable cover plate with "easy-grip" handle and pusher bolt capability provides quick and easy access to the pump interior without disconnecting piping. Clogs can be removed and the pump can be returned to service in minutes. Impeller, seal, wearplate and flap valve can also be accessed through cover plate opening for inspection or service. Inspection of pump shaft or bearings is easily accomplished without disturbing pump casing or piping by removing rotating assembly. Simply remove four bolts from the back of the pump and the assembly slides out. A five-year manufacturer's warranty is standard on all Gorman-Rupp Super U Series pumps. Replacement rotating assemblies are also warranted 5 years.